We are pleased to introduce you to Alex McKenzie; A 2013 Wassaic Fellowship recipient, University of North Carolina at Greensboro alumni (BFA painting), and featured Recession Art artist. Alex McKenzie’s work focuses heavily on process, social forms and the construction of systematic methods of creating artworks. In the past he has created mailing lists, where members receive hand drawn works confined to the size of a standard envelope, he has transformed public spaces into educational resources, such as in his Gatewood Satellite Library project, and generally, Alex McKenzie has approached the materiality of his artwork as incident to the artistic process. We are currently showing a selection of Alex McKenzie’s work at our store. 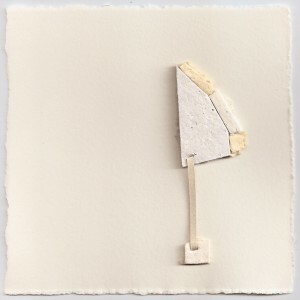 Our collection of McKenzie’s smaller works, are part of his Rubber Band Series. He begins the process of creating these drawing/collages by stretching rubberbands across an 8′ x 8′ board, and attaching these rubberbands to a matrix of nails. By using this rubber band “pegboard” as a surface for creating sketches or prototypes, McKenzie translates these forms into miniature drawings, and in doing so, gives these forms a new, playful personality. Alex McKenzie’s Rubber Band Series is an ongoing project, and will not be completed until one-thousand drawings are created. The project highlights the strength of simplicity through the use of basic forms and colors, and also at times, plays with the ways in which a viewer may interpret or relate such imagery to common symbols. Ultimately these images are abstract, clean and direct. This project is an exemplary artwork in regards to exploring the endless possibilities inherent in an artist confining him/herself within a strict system. To learn more about Alex McKenzie and his artwork, check out a recent interview between me and the artist. “Anthony Tino: Can you explain the process behind creating the drawings in the Rubber Band Series? 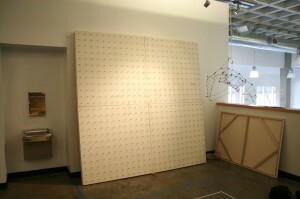 Alex McKenzie: In 2012 I decided to construct an 8’x8’ geoboard; a tool commonly used to explain mathematical concepts in elementary school classrooms. A typical geoboard consists of about 25 to 100 pegs gridded out on a 1’x1’ plane. Rubber bands are stretched across these points to visualize shapes, angles, and equations. I found it to be slightly humorous to create an excessively large version of this object, especially since it had no real reason to exist on that scale. Side note: I even jokingly submitted my rubber band board to Guinness World Records (for “the world’s largest”)… they were not impressed. I was attracted to the geoboard because I saw its potential for limitation. 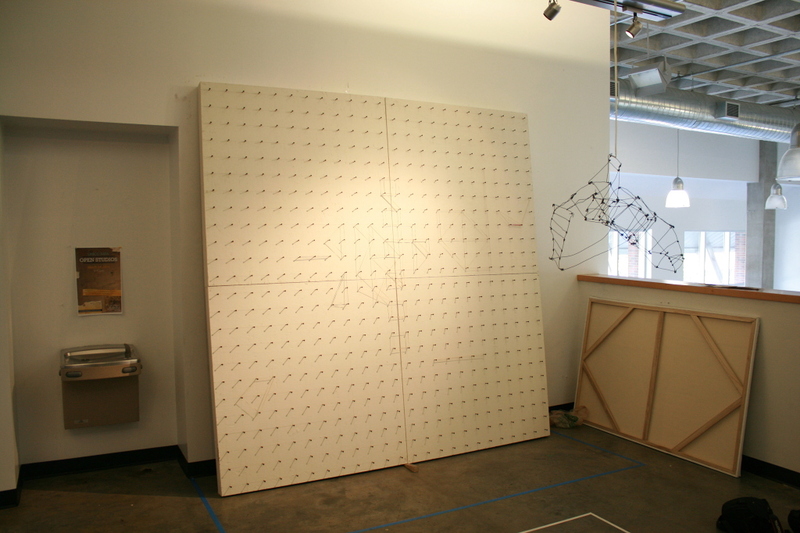 I could create drawings on the board by suspending rubber bands between the pegs, but given the finite number of points on the grid my results were restrained. The process also became physical, as the surface was more architectural than the scale I was accustomed to. After the geoboard’s construction, I decided that I wanted to create a large series of drawings on paper that used the board as a tool. For every drawing on paper I would first create a drawing on the geoboard that would serve as a point of origin. The process developed out of an interest in translation and structure. I was really focused on what it meant to make a drawing of a drawing. It was an interesting problem because I felt that it put those resulting images halfway between representation and non-representation. As the project evolved I became more interested with the idea of stimulus than direct translation. I now see the process being more like a reflection of a purely visual Rorschach test. An image results from an image rather than conjuring a verbal association. AT: How many drawings have you made out of one-thousand and when do you expect to complete this project? 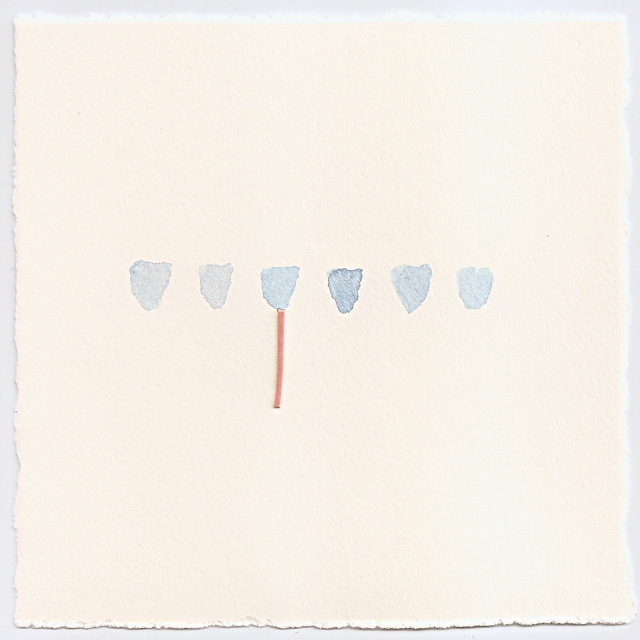 AM: So far I have only completed 512 drawings out of the series. The project is on somewhat of a hiatus because I longer have a studio space large enough to accommodate the board. I am hoping to pick it back up in a month or so. AT: You use a collage element, drier lint, in some of these drawings and somehow managed to make this material seem elegant and beautiful. How did you begin working with this material and what do you feel is its conceptual role in this project? AM: At the time I began the project, a lot of my work was invested in the connection between drawing and sculpture. How could the two disciplines inform each other and how could they merge into one? In a sense the geoboard itself is an object that lies in between those worlds (being both a surface for linear exploration and a three dimensional form). I wanted to reflect that intermediary space in the drawings on paper as well, and collage seemed like an appropriate space to start. My use of the technique began slowly and hesitantly. However, after about 100 or so pieces the collaged portions really started taking a unique character, no longer lying flat against the surface, but advancing outward like odd little appendages. The drawings started to feel like sculptures… sculptures suspended and bisected by white planes. As I became more and more reliant on the technique, scraps of paper began to accumulate on my studio floor. I felt it was a waste to discard them, so I resolved to recycle the remnants into handmade paper. With this type of paper you have a great deal of control over thickness, composition and texture, therefore increasing the variation in the already sculptural drawings. Over time I began to make paper that was almost entirely composed of dryer lint. 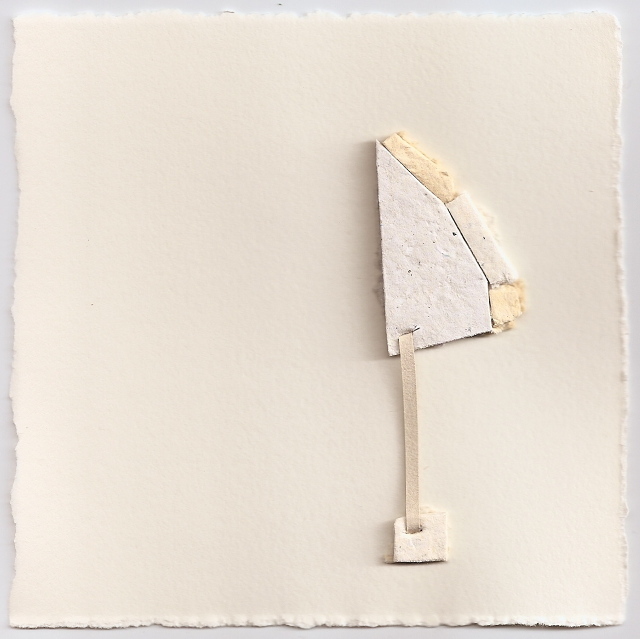 The material seemed to give the handmade paper a personal and naïve touch that reflected the playful exploration that the drawings exemplify. AT: You’ve said that your work considers “intention, endurance, function and finality.” Aside from these themes, what do you think is the main thematic or conceptual element at work in your Rubber Band Series? AM: I think you could argue that all four of those ideas are present on some level in this project. However if I were to highlight any other important thematic elements or purposes within this series I would say it’s important to think of this process as somewhat of a vocabulary generator. Not everything I do as an artist is concerned with the visual/formal but for those things that are, this project serves as a sort of foundation. Although Alex McKenzie currently lives and works in Charlotte, North Carolina, works from his Rubber Band Series are currently available at our store located at 47 Bergen, Brooklyn NY. Be sure to also visit Alex Mckenzie’s website. All images are copyright of Alex McKenzie.